One of the tricks that Doc Porter used to work on the old Medicine Show to stimulate sales of his Kickapoo Indian remedies when I was with him, was the psychology of suggestion. Doc had it down fine. He would always wind up his lecture by a detailed description of the symptoms of all the diseases the Kickapoo Indian medicines were supposed to cure. And the way he'd describe those diseases, how anybody would feel when they were getting them, or had them or were about to have them was enough to make anybody shiver. His method was something like the old-fashioned hell and brimstone preacher bearing down on future punishment till the most of his audience could feel themselves already sizzling. By the time Doc got through describing symptoms practically everybody in the neighborhood would be imagining they felt some of the symptoms at least and would be convinced that they had it, whatever it was. Why, I used to sit and listen to Doc's horror stories of diseases till I'd get to feeling the symptoms myself! Doc was a foxy old bird and I guess he wasn't far off his base when he'd say, most diseases people get are just imagination, anyhow! At any rate, Doc's system of describing symptoms helped stimulate sales of his Indian Remedies wonderfully. I've seen the same idea worked in old-time newspaper advertisements of patent medicines. And there are lots of people who may be fooling perfectly well when they start to read symptoms described in patent medicine advertisements but by the time they're through reading the darn thing they have the symptoms bad enough that they rush right out and buy the cure. Even otherwise educated people and who are supposed to be intelligent are like that; let them hear enough about symptoms and they will get those symptoms, or let them have a queer feeling and they'll imagine they've got some sort of a queer disease. We ran across one queer, get-whatever-they-imagine disease cases down in the back-woods hill country of Virginia when I was with Doc Porter's Kickapoo Show. The people in that section were pretty poor and on most of the farms they used water from shallow open wells, natural springs, or creeks. Naturally the springs and creeks and even the open wells were often infested with frogs, water skimmers, beetles and things like that. 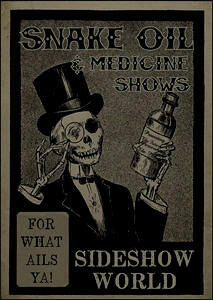 Well, one night at one of our shows a young fellow asked Doc if his Indian Medicines would cure an inside frog. It sort of stumped Doc Porter for a minute and he said: "Cure a inside-what? When Doc came back from the spring he was grinnin' with that wise grin he used to have when he'd get a big idea and felt confident of what he was about to do; and he told Uncle Zeb he'd found out the kind of frog he'd probably swallowed and that he had to work on to get him out of Uncle Zeb's stomach. He said it wouldn't be any trick at all to make the frog come out and for Uncle Zeb to not worry, but he had to work a certain way to get the frog out. He had Uncle Zeb lie down on the ground under a tree out in the yard, close his eyes, and open his mouth, then Doc squatted down by him, put his silk hat over Uncle Zeb's face and told the rest of us to stand back, he had to have plenty of room. Then he said: 'Now, Uncle Zeb, keep your eyes shut tight and I'll stick this medicine under the hat, slush a little of it in your mouth and when the frog smells it he'll come out of your stomach in a hurry. He'll come up so damn quick you won't hardly feel him until he hits your mouth, then I'll grab him and pull him on out--Now hold still, I'm goin' to do it.' Doc run his hand under the hat...Uncle Zeb sort grunted and gagged; Doc jerked his hand out-and damned if he didn't pull out a little green-back bull frog about an inch and a half or two inches long! "Now you can open your eyes, Doc told Uncle Zeb, 'here's your cussed frog-- I knowed my Kickapoo Medicine would bring him up! Uncle Zeb opened his eyes and heaved a sigh of relief: 'I Gawd, you shore got him, Doc, didn't you-- I feel relieved already! An' I'll never take another drink of water out of that damn spring, in the dark, you can depend on that!... 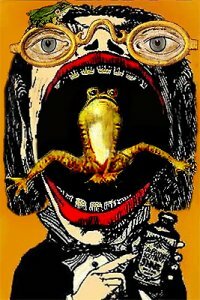 I don't know whether he ever did or not; but if he did and swallowed another frog...it probably wasn't serious. 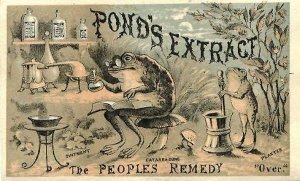 He bought three bottles of Doc's Kickapoo Rheumatism Rubbing Oil--which smelled like hell--so he'd have it on hand just in case he did accidentally get another 'inside frog.' Yeah...Doc Porter was versatile alright, and nothing ever seemed to stump him.